The U.S. Fish and Wildlife Service (FWS)'s recent decision to lift the federal regulation protecting wolves in Wyoming -- and allow hunters and ranchers to shoot wolves on sight across 90 percent of the state -- has reignited the decades-old conflict between wildlife conservation objectives and the ranching industry. Native predator species, such as coyotes, bears, wolves and mountain lions, are critical to the functioning of ecosystems, helping to keep nature in balance. But as livestock farms and ranches have expanded, problems have often occurred where large predators come into direct contact with farmed animals, such as sheep and cattle. The FWS's decision will allow anyone to shoot wolves on sight across most of Wyoming, although wolves will still remain off-limits inside the state's national wildlife refuges and national parks, such as the Yellowstone and Grand Teton national parks and the Wind River Indian Reservation. But therein lays the crux of the problem: Most people still see "conservation" and "ranching" as two very separate -- and often incompatible -- objectives. In the pursuit of maximizing food production, we have done our utmost to eradicate the threat posed by nature to modern farming systems. At the same time, growing recognition of the damage that human activity is inflicting on the environment has fueled campaigns to protect and conserve threatened species and wildlife habitats. The political solution has always been to ring fence dedicated to "conservation areas," which we then protect and do our best to conserve. But the problem is that nature sees no such boundaries and the result of this cognitive separation between modern food production and nature conservation is that conflict inevitably arises wherever "nature" and "ranch" subsequently meet. Which is precisely why Animal Welfare Approved (AWA) is promoting the "Certified Wildlife Friendly™" program -- the only audited certification program in the U.S. for farms and ranches that are working to coexist with some of our most important native predator species. The Certified Wildlife Friendly™ program, which is the result of a three-year partnership between AWA, Predator Friendly®, and the Wildlife Friendly Enterprise Network, was developed to meet growing consumer demand for food and other products from farms and ranches that are committed to coexisting with our native predators. By adopting mixes of non-lethal strategies and commonsense management techniques, such as scheduling pasture use when predation pressure is low and using guardian dogs to deter predators, farmers and ranchers can keep livestock safe and wildlife alive without resorting to lethal control measures. Using these techniques is a way to minimize the risk of conflict between farming and conservation objectives. Farmers and ranchers who undergo a third-party audit and demonstrate compliance with strict standards on wildlife conservation can market their products -- including wool, meats, eggs, honey, leather good, and more -- using the Certified Wildlife Friendly™ logo. Using this approach, we can encourage farmers and ranchers to help protect some of the most important habitats and species across the United States, while opening up new business opportunities for sustainable farms and ranches. Last year I traveled to north-central Wyoming to visit a living example of how farms and ranches can work in harmony with nature, rather than trying to control it. At 580,000 acres, the Arapaho Ranch is the largest USDA certified organic ranch in the United States. As I drove across the ranch with the ranch manager, I noticed significant numbers of non-farmed animals, with moose, elk and deer grazing the pastures. This was in complete contrast to other ranches that I had visited before. The ranch manager explained that the Arapaho approach to ranching recognizes these fellow "users" of the range as equal inhabitants, rather than as competitors. I knew that wolves lived on the ranch and had heard that wolves would readily prey on domesticated animals. So how did the ranch deal with this threat to their livestock? I was quickly put straight: First, the Arapaho ranchers aren't convinced that the threat is nearly as significant as some might think. Second, the beliefs of the Arapaho Tribe mean that the ranchers can only address the challenge using non-lethal management. Indeed, the ranch operates a unique wolf management plan, which has been approved by the federal government and gives the tribe full control over decisions concerning the local wolf population. 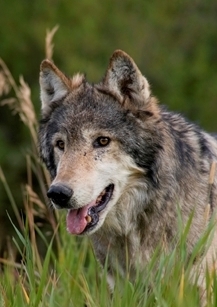 The Arapaho Ranch wolf management plan is as fascinating as it is common sense. The ranch manager explained that the ranchers know the whereabouts and hunting patterns of the wolves very well, so they ensure that any cattle grazing in the areas patrolled by wolves "are cattle that the wolves do not consider as prey." I must have looked a little confused. He went on to explain that wolves generally take the injured, sick and young cattle. By ensuring that any injured, sick or young cattle are not grazed in the range of the wolves, the issue of predation is avoided. Similarly, the very presence of the wolves discourages wild moose, elk and deer from staying too long in the grassland, which helps to prevent the potential spread of diseases like brucellosis from wildlife to the cattle, which can cause abortion of calves. It's a simple and symbiotic solution to the challenge of native predators, which is reflected elsewhere on the ranch. The ranch team is made up of cowboys who grew up with the philosophy of respect for and knowledge of their surroundings, and who know how to interact with the other non-farmed inhabitants of the ranch. Some people might argue that ranching in this way could not possibly make a bottom line profit without some complicated argument about the "value" of habitat conservation or external funding. So I was a little taken aback to find out that the ranch is making an operating profit. Here was a living, breathing, working example of how to ranch in a truly sustainable way, in harmony with the surrounding environment, and still make a living. And many other ranches and farms across the United States are doing just the same. Pilot audits for the Certified Wildlife Friendly™ program are now underway, after which the program will become available to farmers and ranchers nationwide. To stay informed, sign up to receive AWA's free monthly email newsletter at www.AnimalWelfareApproved.org or see our Facebook page at www.facebook.com/AnimalWelfareApproved.